Tuesday, we get to do my favorite thing—prospect for new dinosaurs. 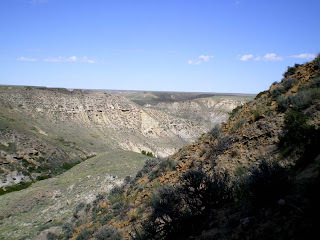 There are a couple of regions I have seen in previous visits that I have wanted to walk out, to see if we can find more dinosaurs, but I have never had time before. So, everyone is glad for a break from quarrying, and we split into teams and head out for promising badlands. It is hot and sunny, so I am hopeful. We are encouraged at first, as we find a lot of areas with bone fragments weathering out. But, following them up and out doesn’t reveal any more of them, so we move on. The dinosaurs in this region are rarer than what we find in the Hell Creek, but when we DO find one, they are usually beautiful, and almost complete. So far, no sign of that though. We do, however, have some of the best views in the country as we sit in the shade and eat lunch…fancy restaurants in the city just can’t offer this kind of ambience. This is about as big as our prospected dinosaurs got…sigh. I know there is more out there, just waiting to be found…. It’s just too bad that this photo can’t convey the shimmering heat waves! Shade and a spectacular view…what more could you want in a lunch break? And, this is not anywhere near as hot as it will be, trying to do this same work in a week or two. Still, for all of it, I would rather be here, in the empty, than in any town…we see hawks and terns and rabbits and deer, and even the tracks of the big mountain lion that hunts these gullies. One thing about prospecting is that you train your eyes to see small things. 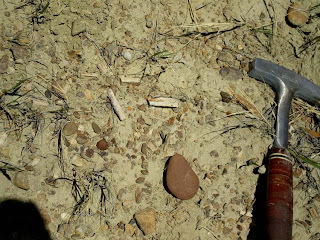 It is amazing how my perspective of the prairie and badlands and the life they contain has changed as my eyes become trained to look for small fragments of bone. Well, not just my perspective, but my stance, as I now walk like a very old person, hunched over and squinty eyed, but that’s another story. 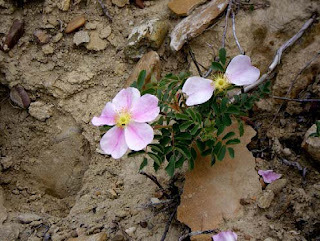 I also find this lone wild rose, growing up in the middle of a sand outwash. I always marvel at how, out here, under such harsh conditions, life still finds a way, and there is beauty to be found in the harshest circumstances. The badlands are a good lesson for life, I guess. Wild roses always remind me of my mom. They smell better than any store-bought version! Thank you so much for sharing your work on the blog. I especially appreciate the photographs and I'm pleased to see young scientists interested in this work. 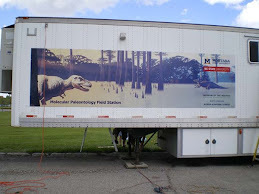 Dr Schweitzer I under stand that DNA can only live 10,000 years,So how can this T -Rex DNA be 70 million years old. Doesn't this find help to prove creation, not evolution. I'll argue "no" since she shouldn't waste her time answering such a simple question. If there were no other independent evidence dating the age of the layers in which these items are found, questioning the age of the soft tissue might have more credibility than it currently has which is not much to be generous. The problem is that if we are wrong about something which the discovery implies (nothing new to science new evidence=>progress), the existing evidence clearly favors being wrong about understanding some of the mechanisms of fossilization and soft tissue degradation, NOT the age of this kind of organism. The reason is because you must account for ALL the evidence, not just one piece. If you think this soft tissue MUST be young due to this discovery, you would first need to explain how via natural a process a very young thing, can be encrusted by a very OLD thing, which is verified by multiple independent methods that are mutually supportive. Notice how the "argument" for YEC conveniently assumes what you say "what we seem to know about fossils and decompisition [sic]" is accurate and complete. Given the other very strong and mutually supportive evidence for aging of rock layers in which these bones are found encrusted, it doesn't follow the age assumption is wrong, but rather our understanding of how tissues degrade in these cases.